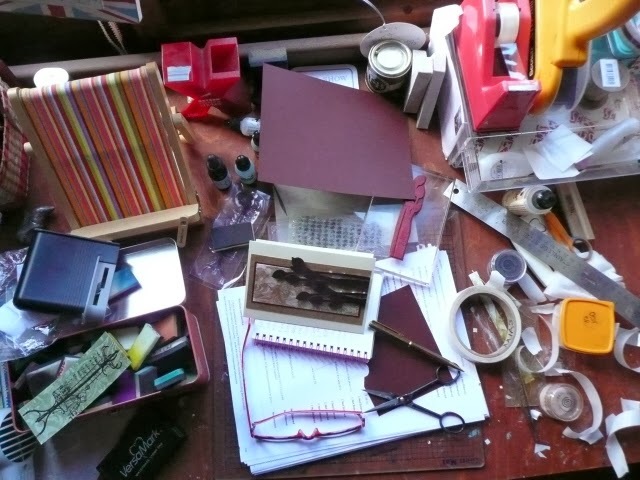 Well, considering what I plan to do and what I had planned, my desk is disturbingly untouched since last Thursday. Events, as they say, have overtaken me. Still, at least there's something to see that isn't just a mess! See, last Wednesday afternoon was spent in the company of craft friends, and in the pursuit of craft shops. No problem, straight to Snazzy's at Swindon. On the basis that I have cards to make for the Marathon, I managed to score the two Hero Arts sets you see on my desk. Love 'em. Not sure if they'll appear in the Marathon though, but it was a very convincing excuse! My phone and ipad are in view, together they make look like an Apple jerk. My glasses are on my head, as a hair band, naturally. So the case is empty; I'm in the habit of using it because it makes me happy. You can clearly see Brilliance ink pads. Using them feels a bit like a blast from the past, but I love them, and the water colour thing I've been doing with them is, if I say so myself, very pretty! And the elephant on the desk is the Diet Doodle Book. A really fab gift from Laura who knows that I've been on a diet for the last six centuries, and knows too that I need to write stuff down to stay focused. This doodly approach is fab, I might share some of it - kinda like journaling without having to make your own pages! 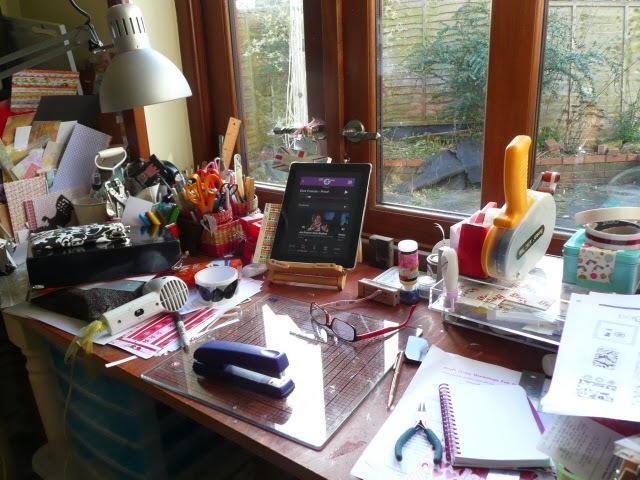 There's a recent post about joining in this WOYWW lark that elicited a lot of response and so gentle reader, please would you cast your eye over it too, at some stage...just to brush up on the housekeeping of all these desks. Thank you! I knew that I'd do a review for the TeaPod as soon as I visited the website and watched the video. I drink tea. I like a great design. I really like choice. I like a new angle on an existing product if it works. And the TeaPod was all that..and I'm a sucker for great packaging! Did I ever tell you that it took me over a week to open my new iPod because I didn't want to spoil the sublime packaging...even the pristine cellophane.....Oh, I digress. 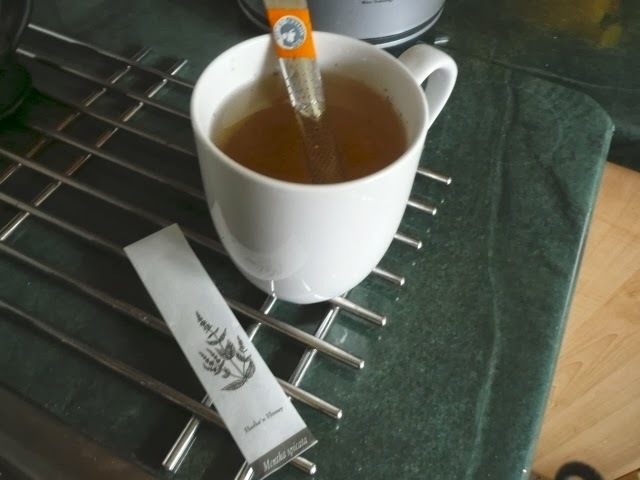 Mr TeaPod sent me a handful of samples from their range of eleven teas, all from Fair Trade estates in exotic Sri Lanka. Just as well he chose.... eleven to choose from for heaven's sake - I have trouble choosing a mug to drink from! So, I made a cuppa, following the directions. Not gruelling. Drop the TeaPod in the mug, pour on the freshly boiled water and allow the tea to infuse. Then..use the TeaPod as a spoon, stir, add milk if desired and carry on as usual.The thing about the Teapod is that you can leave it in if you're a herbal/fruit tea enthusiast, you get a real infusion, as it should be. Unlike us 'builders tea' types who leave nothing but the spoon in - and here's an advantage...the TeaPod won't leave you with a blunt force trauma to the face like a teaspoon will! Although of course, you, dear Internet, are far too well mannered to even contemplate leaving a spoon in, I know. 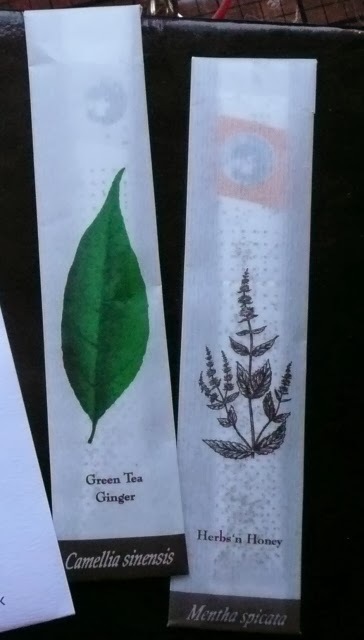 Of course, with no tea bag, there's no squishing against the side and running to the sink or bin....indeed, a polite tap on the edge of the mug and there was no dripping. In the relative comfort of my kitchen, I had a fair trade brew which was very nice, perfectly measured and rather a fun thing to make. And then I popped the TeaPod and its envelope in the recycling bin. So bring on another test. When I'm out delivering - and particularly if Mr D comes too, I take a flask of boiling water, a teaspoon, two mugs and four tea bags. We share a mug of tea made the normal way - the second mug is to drop the used teabags into. Colour me utterly delighted by the TeaPod then. We each chose our preferred tea, I had my own mug and I didn't need the teaspoon and extras. And the pod goes back in it's little envelope (re-christened a 'sleeping bag', because one of us couldn't think of the right word...). And now I don't have wet and mushy used teabags to deal with when sorting out the snack bag. Genius! Now this may not be a large thing for you - but for us tea drinkers on the go, it's an awesome step up! And then of course, there's the erm, arty, decorative potential of the TeaPod . You can buy TeaPods directly from this page of their website. Using that link will entitle you to a 15% discount. How cool is that. So cool, it's almost herbal, man. Furthermore, to infuse you with a similar enthusiasm, there's a chance for you to win a year's supply of TeaPods - *insert little shriek* - I love this part! A year's supply - that's over £175 worth of TeaPods..how fab a delivery will that be! It's open to UK residents only - and worth a pop, huh! All you have to do is visit the competition page on the TeaPod website and answer a very simple question. Mr TeaPod assures me that you will not be bombarded with mailshots and spam emails if you enter, it's not the way they work. Like a lot of us, they intend to treat potential customers they way they would like to be treated as potential customers. Does that make sense? If it did, hurrah. Excuse me now, I'm away to infuse myself. Probably fruity this time. Hey gentle readers. Things arise as a result of being a blogger with a MEME that need a discussion. Or a gentle reminder...and so, in advance of another WOYWW, I thought to air a few often asked or commented upon issues. Monica and I would like someone to explain how to comment on Google+. It makes me bad tempered that I had to join, had to open a GMail account and now can't work it out. I know you lot will be gentle with the explanation. Loads of Deskers want to point out that Word Verification is incredibly frustrating. If you use it, please don't be disapponted if your comment numbers are lower than average..it's really difficult to do - especially from a tablet! There are alternatives that are pretty effective : comment modification means that you have to approve comments prior to publishing. It means that you 'manually' control any Spam. And you can also change settings so that Anonymous comments cannot be left. That cut out about 9000 spam comments a day for me! Even MORE Deskers actually become quite agitated after going through the Word Verification process only to be told that the comment will then wait for Modification. I confess that I'm one of them..especially if I'm using the iPad which hates Google and makes any process on it as difficult as possible. Wordpress users are not exempt - Verification by having to type in the email and URL is equally time consuming. Again, even Copy & Paste or Auto Fill aren't really the answer, but....I don't know if you have a choice or not - so Wordpress users, speak up! 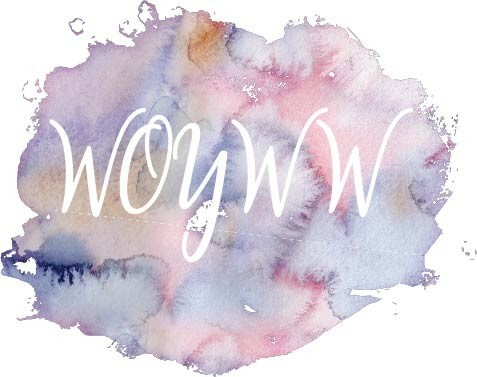 Remember that the link list on WOYWW posts is exactly that - a list of links..click on any name at any number on the list and you will automatically have that particular blog load in your browser. You don't need to click on names in my comments to find their blogs. 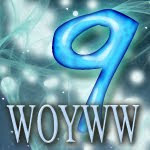 When you link to WOYWW, you don't need to worry about leaving your link list number on MY comments. When you comment at other Deskers, you do need to tell them your link list number if you can possibly remember to do so...it's just easier/quicker to find you. During the Northern Hemisphere winter, my WOYWW post goes up between 2 and 3 am. (I'm in the UK, that's a GMT time). This gives you exotic International Deskers a chance to be in the first and teens, number wise. As the world turns, and my mornings become lighter and more bearable, so I start to post WOYWW live - and that will be anything from 6.00am to 8.30am. It depends entirely on what my wednesday plans are! If you wonder why your position on the list changes between typing in your blog address and the link appearing on my page - it's simple...someone else is loading their link in as well, and the computer will arrange them.....so, if you comment that you're number 15 and then discover that you're actually at number 19..take a smile from the fact that others were linking at the same time as you - that's real 'hands across the world ' stuff! If your position on the list changes some time after your link appears - it's even less complicated. It means that I've removed a double, incorrect or unfair playing link, and the list automatically re-numbers. I figure that if you leave your number in your comment and it changes, your reciprocate will work out that actually, you're just above or below the number you mentioned. It's still easier than searching 3 columns and 100 odd names. Especially as we know each other by blog names even better than we know each other by Christian names! I should re-iterate that whilst it's meant to simply be fun, some rules have had to develop...and yep, I sometimes do remove links that don't participate in the spirit of WOYWW. If you aren't getting comments from people on the list, it's because your post isn't in the spirit of showing your desk and telling about what's on it. Simple. If I remove your link and you can't work out why, do ask me...because I won't necessarily email you to say - I figure the handful of times I've done so, the reasons have been really obvious! At some stage, I know not when, it became obvious to me that the stamps I overlooked when on a shopping spree were probably the genre of images that were 'arty' and the ones I wouldn't know what to do with. Or the ones that I looked at and thought 'oh that's great, but really, I can draw that'. Yeah. But I never did. And, I can't stamp and emboss my drawing can I? So little by little I got brave and equipped myself with stems, squiggles, splotches and blotches. This little gem stands out though, it really has been wonderfully useful. And remains so. Ah well. It's just to show you one of my most loved and more importantly, most loved stamps. Yep, a wood mount. But it's available as a cling these days too. It's by Magenta (distributed in the UK by Woodware Crafts). I've had it for at least 10 years. And I use it on something - card or LO, at least once a month. 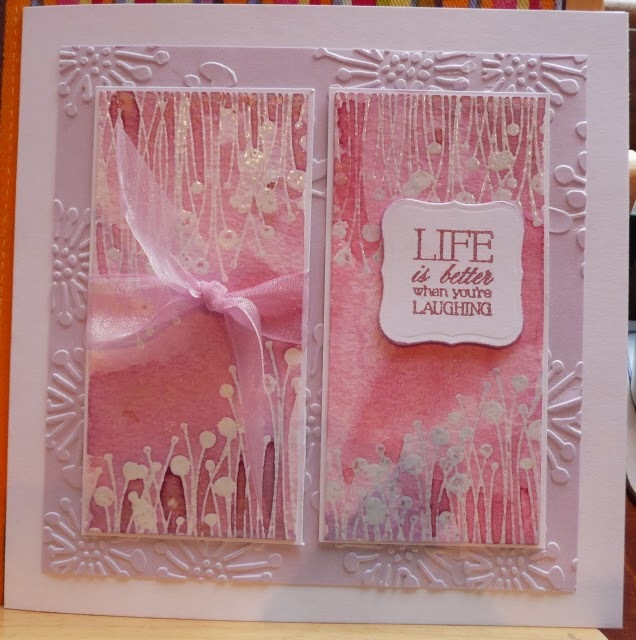 This card is for a Batik Style Backgrounds workshop coming up. I was unsure about it - because I was a bit unconvinced by the colours, but it's been well received in those terms of colour, and two people have said that they like a workshop card that gives them ideas for stamps they already own. Oh. OK then! 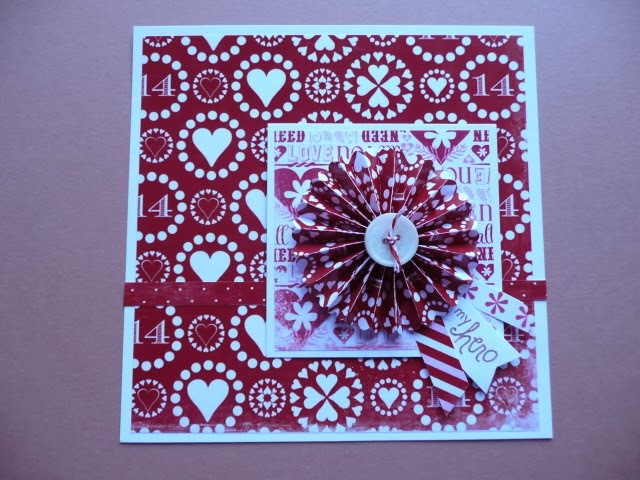 A couple of years ago at a Christmas Card making day, I used this stamp to make a wreath on a card front - that is still talked about amongst the Marathonati. I think it's because of the useful-ness of a seemingly plain image. Today, I'm planning at least two hours of uninterrupted desk time, and this stamp will be featuring. I have Card Marathon samples to make and I think it only right and fair that I try to use it again. 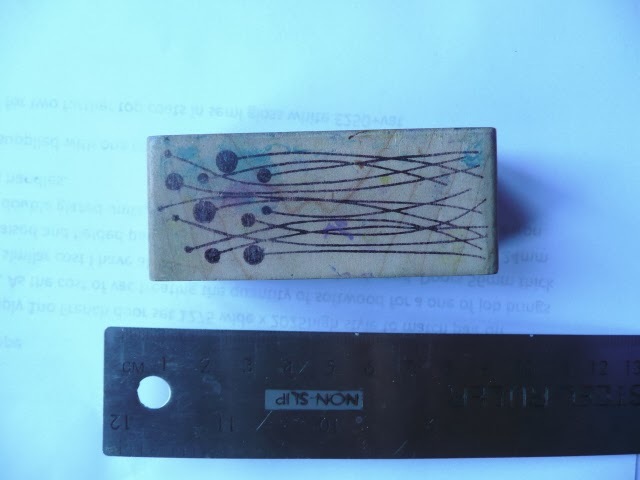 I might show you more of my long serving trusty friends stamps if you show me yours. Please see the pages above if you're wondering 'what on earth 'or 'how doI? ', and if none of that helps, please ask in a comment! Welcome to WOYWW . I thought my desk was within reasonable control until I uploaded the photo. It's quite hard to complain at myself, but really - why don't I put stuff away when I've used it instead of apparently and quite literally, dropping it from my hand? The scissor sharpener being the case in point. Well, one case in point. I managed an hour long daylight session on Tuesday afternoon...you get to enjoy the fall out. 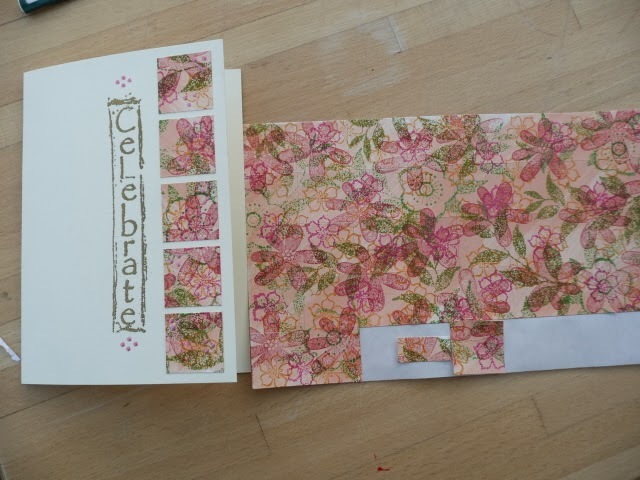 The card is for a workshop on using batik principles to create backgrounds. I know you can't see much of it, save that Paper Artsy stem image. That's one of my all time faves. You can't tell either, but having done tax returns, new vehicle paperwork, VAT returns and a year end analysis, my pile of scratch paper is about 1" high..it's not convenient when you work all over the place like this..things keep falling over the edge! What are you working on today? 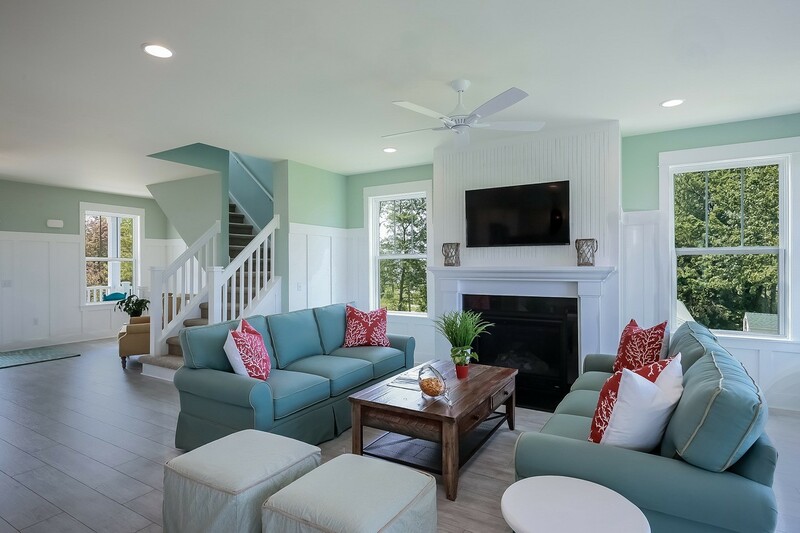 We'd love to see the what and the where...put WOYWW in your post title and link the post here so that we can swing by and visit. It helps ENORMOUSLY if you can turn off word verification...try comment approval instead? Do some reciprocal visiting and enjoy! ..to my self-publicity circus! I'm involved in two upcoming events that I will inevitably talk about - my desk will be covered in ideas and makings for them, so you may as well have the full gratuitous self publicity thing all at once. 'It includes three card making workshops, home made lunch, refreshments, 10% off voucher to use in Japonica, and lots of fun and friendship as you craft together. This season's workshops will include stamping and using inks with many techniques. The day costs £42 and is great value - it would make a great Mother's Day Gift! If you need any more info or would like to book your place, please call the shop - Japonica, Exmouth, on 01395 271739, or email janetcaudrelier@msn.com'. 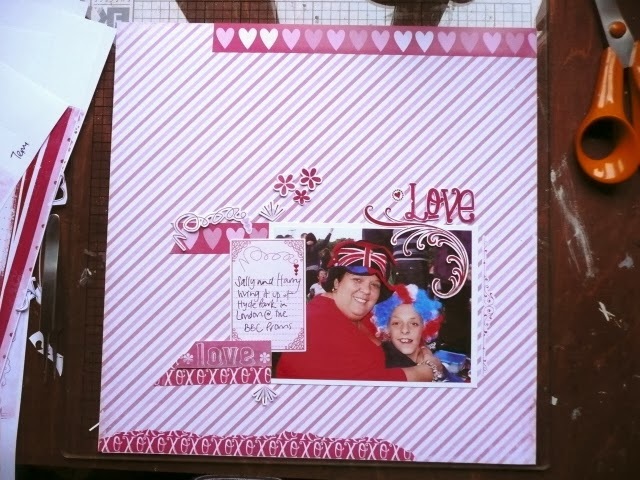 This is actually for a Workshop at Kraft Crazy this week, but I've done a very similar one for Janet! 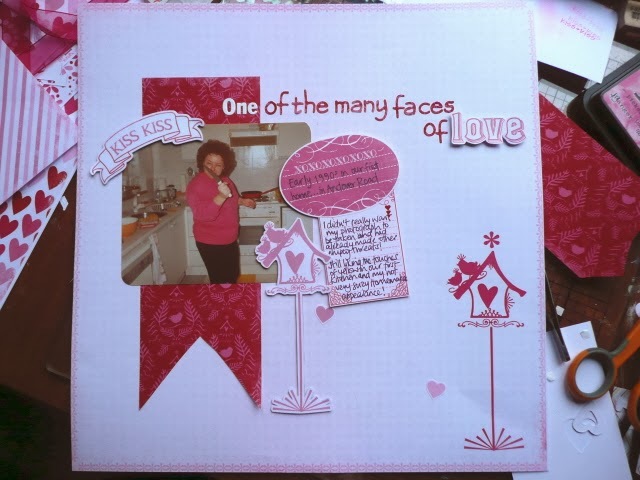 The third 'experienced crafter and tutor in this scenario will be Francoise Read. It's worth the fee just to meet her and get an injection of her warm good humoured and gentle skills. She is a stamp designer - for Woodware, and Stampendous...and wears her skills so modestly. I should learn from her. I could. If i had any skills that were worth touting. To be honest, the skill I bring as a 'tutor' is probably bossy good humour...and I hope, making everyone leave with a finished something....because I hate going home with UFOs. They NEVER get finished! And then, me and Scrap Lady Ally are doing a Card Marathon on April 12th. Yep, a Marathon. 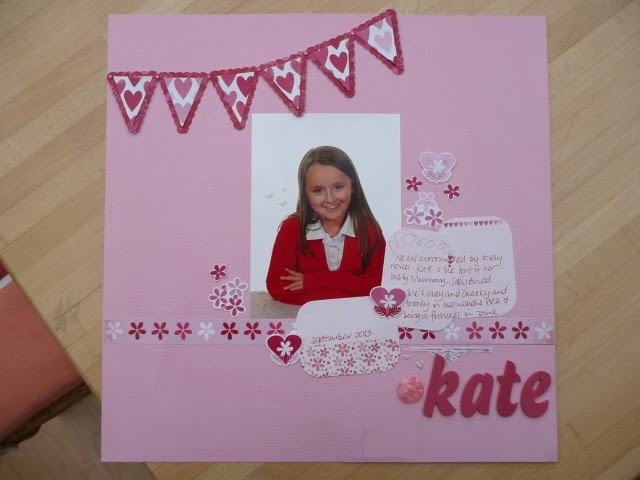 We supply samples, kits and tools to make 20 or so different cards, different themes, styles and sizes. You make cards, we feed you with cakes and lunch made by Lunch Lady Jan herself, and then you make more cards. It's gruelling. It's to be held in a Church Hall in Amesbury and booking is essential, the kit numbers and catering mean that we need numbers in advance! There is a separate page to view the flyer and booking form, a clickaway at the top of my blog, or you can visit www.2scrapladies.blogspot.co.uk just as soon as it's been updated. Please give us a chance, it's all a bit erm, argh! This is the decoy photo. It's one of the LOs that I did for Luscious Life Studios. It features my 1980-something perm. I kinda thought you may like to see it. More to the point, an alternative colour way set of papers is available as a freebie download if you follow that link. I think that's it. For now. Really, this 'all about me' way of living is becoming a bit exhausting. And, to finish where I started....I'd like to HOPE and THINK that my desk will betray signs of preparation for these events. If you don't notice, would you please prod my conscience? I like a fast result, once I've made up my mind to do something. Perversely, I can put off actually doing it for ages. And, whilst doing it, I'm pretty patient with myself. A good example of this will be the blanket I made from 9956,248 six inch crocheted squares. Which I'm going to unpick and re-do because parts of it really bother me; I want the squares to be smaller and also one of the colours is wrong and I don't want it to be included and...well there we are. So...when double sided tape became acid free, I started to use it in preference to glue. Wet glue that is. I had previously given up using the stick glues..after a 'front-dropping-off-the-card' incident at my parents home one Christmas. Pritt stick and dry central heating - lesson learned. I don't really have the patience for wet glue..all the drying and paper ribbling. So I stopped using it. I did develop a passion for the glazes. And the first in my line of vision was Diamond Glaze. I guess that market is thoroughly cornered by Glossy Accents now, but the DG (as we used to call it) remains a fab product. Yesterday, I finished a bottle of Diamond Glaze. it was a 14oz bottle, so quite large. And it has worked its magic on spots and dots for over 5 years. It was a white plastic bottle. To protect and prevent it from discolouring in daylight I expect. Which of course meant I couldn't tell how much I had left. So I drizzled it over my newly decorated box, expecting to have to reach for the spatula and do some frantic spreading, just to get a protective glaze all over. And I drizzled. And I squeezed. It's hard work. The bottle kept giving, so I kept drizzling. It was running slower than I remembered Diamond Glaze to do, and I cheerfully put that down to thickening - it has been on my shelf for so many years. The part I neglected to think about was the possibility of accelerated drying time in such an 'old' product. And so, as drizzle faded to splatter, I discovered that the original 'lines' were too set to work into a smooth, dimensional, superb gloss coating. So now I have an artful drizzle topped box. Am quite liking it actually, and will very possibly do something else to it. After much procrastinating of course. Meanwhile, I have a home for the unruly tapes, I have finished the old Diamond Glaze and the biggest bonus of all time - I didn't have to wait for it all to dry. This box was a Bratz doll wardrobe I believe. I bought it for £2 from a Charity shop. The lady was mystified, and asked if I had dolls. I admitted that no, I did not, but I had lots of tapes waiting for a home. Obviously, the lady was yet more mystified, but hey - she shouldn't have asked. It's like trying to explain scrapbooking - eyes glaze over and frankly, I just didn't have the patience! Sum it up - a lot of everything...lots of stuff cleared off it - which is a good thing. And lots remaining. Not great, but not too onerous. My ipad poised toplay part of a crime drama I've been listening to. 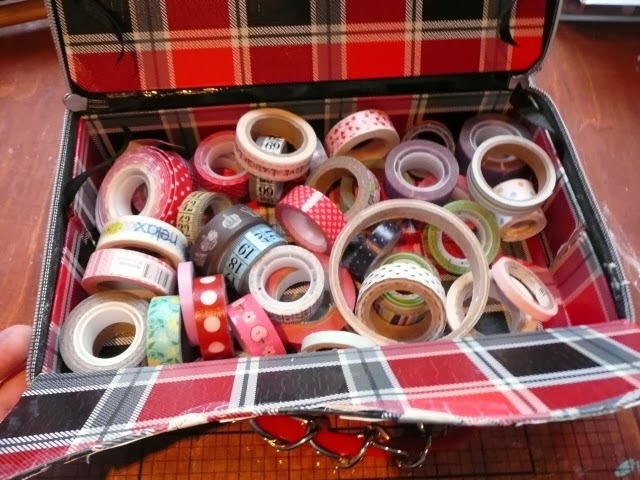 The black box at left is awaiting a cover or a lick of decent paint or something...it's to house my ridiculous washi and other tape collection which is frankly getting out of hand. 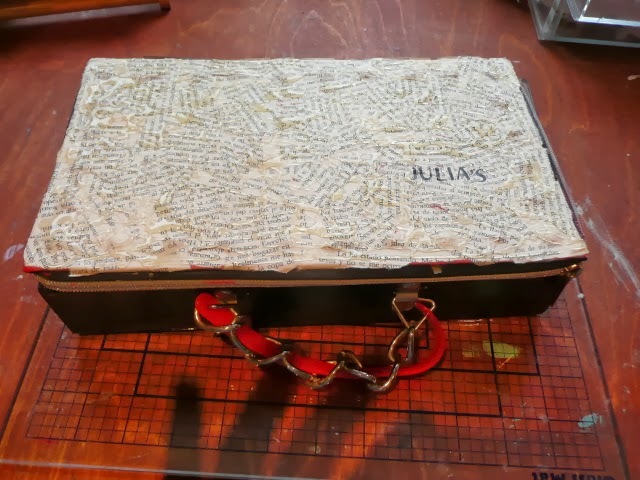 It was once a wardrobe/case for Bratz dolls. Glasses case on top of that. 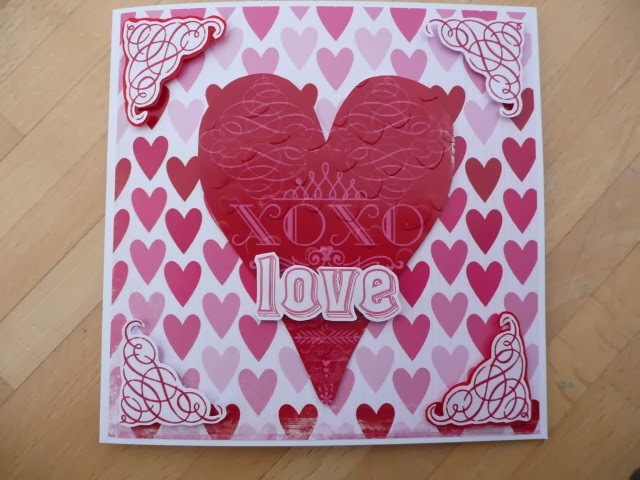 You can still see some of the Luscious Valentine papers waiting to be put away...I'm not quite over them yet, so haven't stored them...or that's what I'm telling myself. And there's a new addition this week...indeed, just yesterday..
Jan and I were in a lovely kitchen shop in Salisbury. She on a mission, me browsing. She caught up with me in a section of the shop that was unstaffed and gave me this mug. I had strolled past the rack of mugs and not even noticed it. We howled. So much so that staff came to see what was so funny. And then of course, they didn't get it. And so we howled some more! Honestly, my face was aching. And now, in an effort to make my desk tidy....I'm using it for pens. Ta Na! You have to be in it to get it, huh! Be in it then please, link your WOYWW post here and we'll trot round to visit. And can I add - word verification is incredibly difficult to negotiate for this old woman with an iPad that hates Google..it really makes it so hard to comment. And also...why do I have to tell every wordpress blog who I am, what my email address is and what my website is? It drives me nuts and causes heart sinking delays in getting a comment typed! And don't try to stop me being cross by telling me about auto fill. That is so not the point! 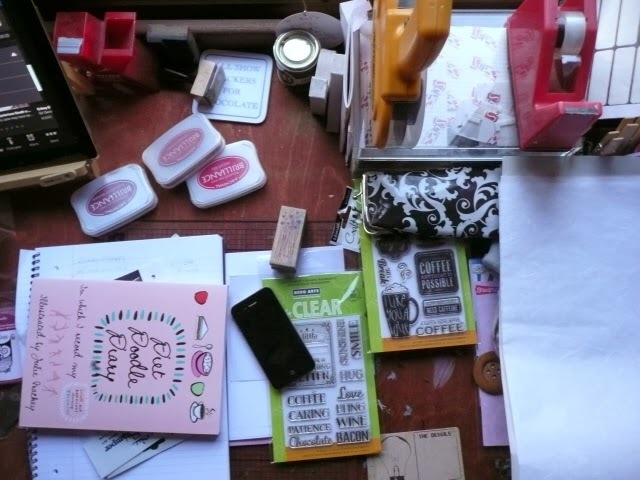 Oh and PS...I've put a few stamps for sale on my erm, for sale blog. 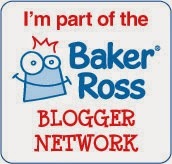 Quite innocently, I mentioned that I blog under half an assumed name. Dunnit. As a surname. Because back in the day when I used to sell my cards, I used to 'sign' the back of them with a stamped 'hand made by' and so I started adding Julia Dunnit. Because I did do it. So what about the first name? The one I didn't make up or choose? Julia. I've no doubt a quick leap about Google will reveal it as descended from the Roman Julius in a female derivative. I cannot tell you why my parents chose it from the panoply of girls' names - I'm not aware that it was a particular trend at the time, and every now and then, I suspect it was a teeny rebellion against the name Julie. Because of course, the one letter difference has caused me a little irritation and some confusion over the years. But it's all good. Until your dearest friends start defining it. I've no doubt, gentle reader, that this was written with affection. But I've been considering it a lot. And I'm still walking around it. Because you see, although it was attached to a gift at Christmas, I'm not at all sure that the implication was innocent. And when I asked her, Jan just laughed hysterically. So be careful. It's not how you choose the name, but how it comes to mean something that counts. Please, live your lives without blemish so that your friends can't write your epitaph on a gift tag. Today I've moved on. I'll be conducting a workshop, the fixings for which you saw on my desk yesterday. So that's tidied that lot up. Underneath were the Valentine's papers that my clever Sissy designed. She is Stephanie of Luscious Life Studios. I appointed myself the Luscious Life Design Team member and it all kinda came home to roost and I had to put my money where my mouth is. So I've been playing, and how I've enjoyed just doing it for the sake of doing it. 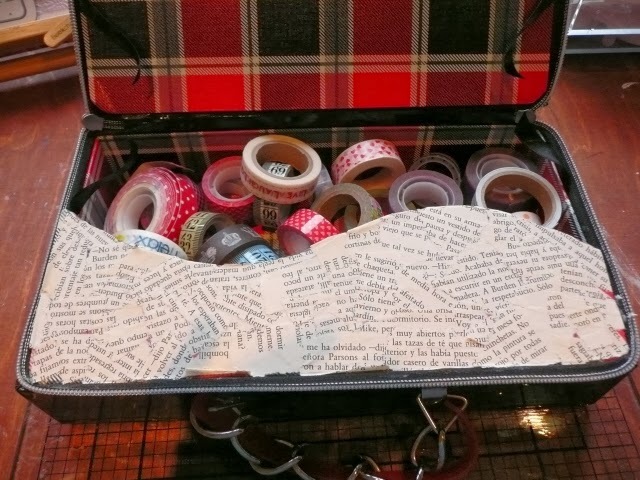 I've tried to use the papers for non-valentinsey stuff in my scrapbook. Mainly because in 29 years, I don't have a Valentine story to tell yet. Hmm. But at least my deprivation proves that you can buy a set of something seasonal and not be trapped in the season. I think, anyway! And here is my other sister, Sally, and her son, my only nephew. Being very patriotic. I love this picture! And then I sort of felt obliged to make some cards because - well, I can. 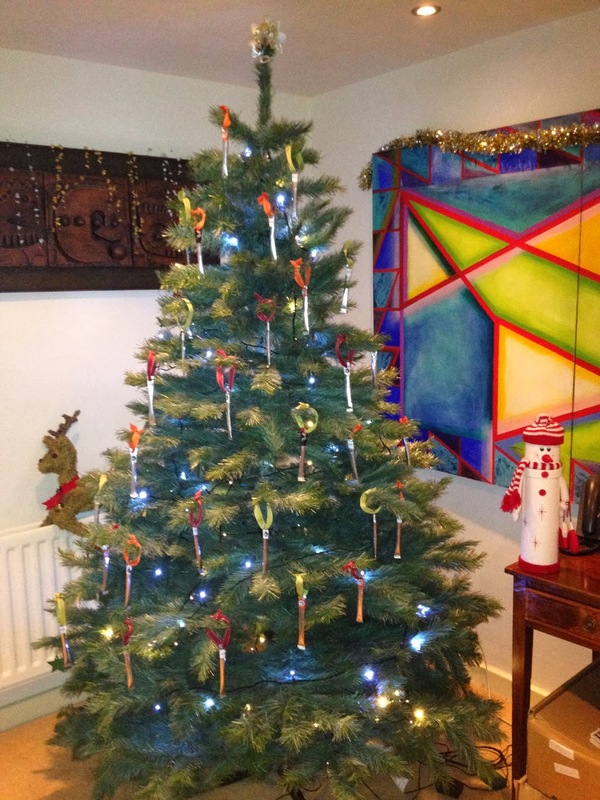 And you know what - I decorated the inside too, and totally forgot to photograph it! Quite busy, non! Well, it's only once a year and there's a message to be got across! There's a couple more I could show you but I think Steph is planning to put them on the Luscious Life website or blog, so I'll leave you to go visit in the next few days if you're fascinated by the papers, the story, my family,or the perm I had in the early 1990s. I know I've over linked, over abused and overdone the publicity, but hey - it's family. And also, this doesn't break my oh so up myself rule about endorsing something that I don't think is up to it. I'm loving the Luscious Life! If mess makes your teeth itch - look away fast! Oh my. I thought that I was a bit pushed for crafting time this week.....and I was certainly too pushed to clear up, apparently. 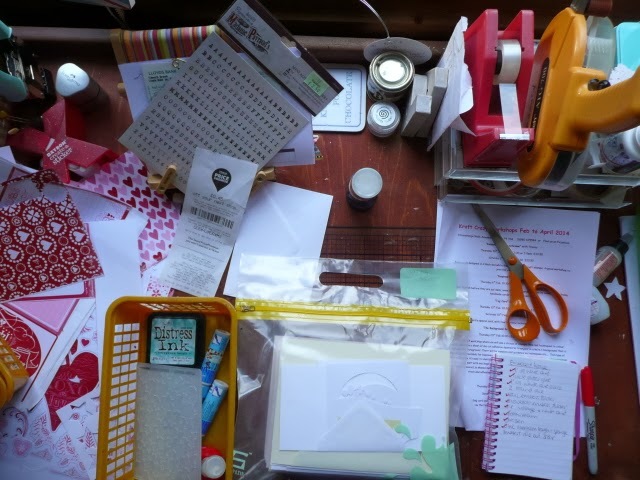 The lovely bright Valentines papers at left are from my sister's digital website, Luscious Life Studios...I've done some LOs and cards, will show 'em soon. The alpha stickers are slung there because they are slung there. I've no idea. There's even a receipt from Tesco supermarket promising me some pence off my next shop. Which will not come to pass if the receipt stays on the desk. The plastic bag is full of card kits for my first workshop of the year on Thursday and the yellow basket is one of four filled with the 'ingredients' for the cards. So my life...a clear up is in order..and strangely, because I'm at the end of 'making do' in this mess, I'm in the mood to do it! 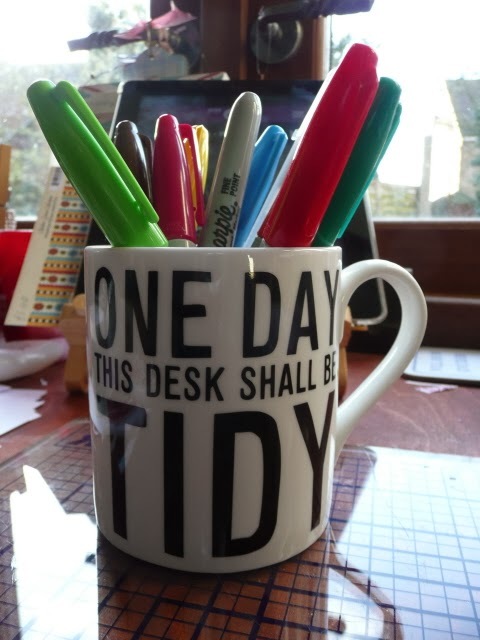 Share with us do - what are you up to on your workspace this Wednesday? Put WOYWW in your post title, link your post here and we'll trot round for a visit. If you'd like to take part and can't fathom how, please click on the links at the top of the page. Don't be scared. It's easy and we're friendly. Actually, it's Coffee. It always is if it's before 1pm. Oh the things you didn't know about me! This little vignette set itself up last night actually; the mug of fresh coffee is this morning's addition..I come downstairs, make a cup of coffee and immediately throw myself into my comfy armchair to contemplate life whilst I drink the coffee. I'm bedraggled and usually chilly, and still in bedclothes and a charming fleece dressing gown (robe) that would do any woman of my age proud. It has a tassle on the zip...my daughter thinks this is the last resort in my becoming an old woman. And she's probably right. I did consider removing it when first I bought it, but that only lasted as long as it took me to do the zip up. A practical and attractive embellishment to a zip, I now think! Now that's a real digression folks, just in case you ever thought me incapable of such a thing! I'm linking to Bleubeard and Elizabeth's very civilised Tuesday sharing of cups and tea. It's so nice to join others with a brew. I was going to try to answer some of the wonderful comments that were made following my post 'Please Sit, there will be questions'. But it's all a bit self evident really, as one reads the Comments. We are a bunch of internet users who, having searched a bit, found a community to be a part of, and we like it that way. And for validation of course. 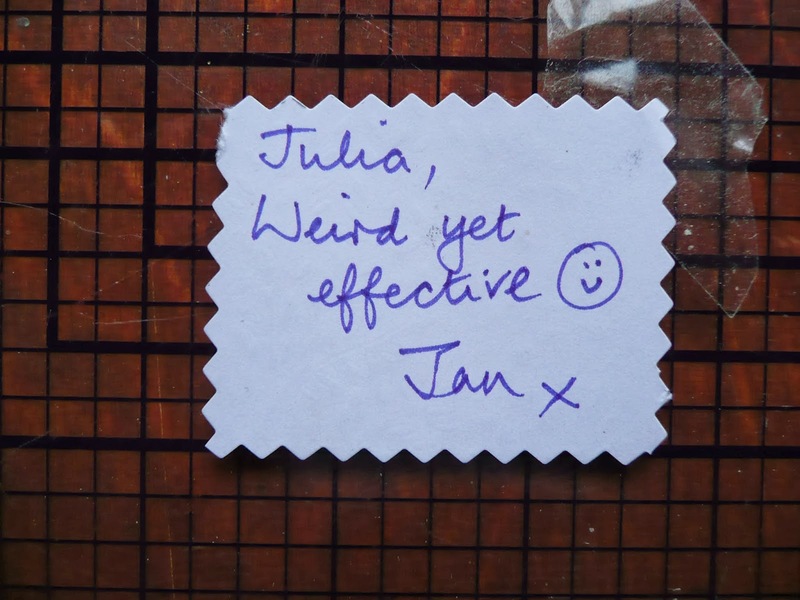 One of the big things that came out of it was some general surprise at my revelation that Julia Dunnit is not my real name. Well, your surprise surprised me! 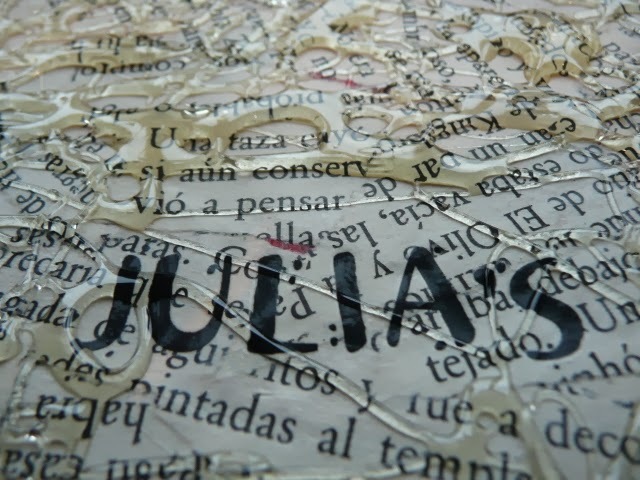 Julia is my name. Given at birth, of course, and chosen as a 'we like it...' type of name because I was the third daughter and they had already used up the two names they assumed they'd need. But Dunnit is made up. And not made up for security or even for reasons of big headedness. Just because it was a fun thing to write on the back of cards I'd made. And so when I started to blog, apparently about my crafting, it seemed sensible to use my craft name. See. Even my interesting parts are dull. So fuelled by my first coffee, I'm off to face the day. Have a good one. Come back tomorrow to be amazed and erm, horrified by the desk, huh? !